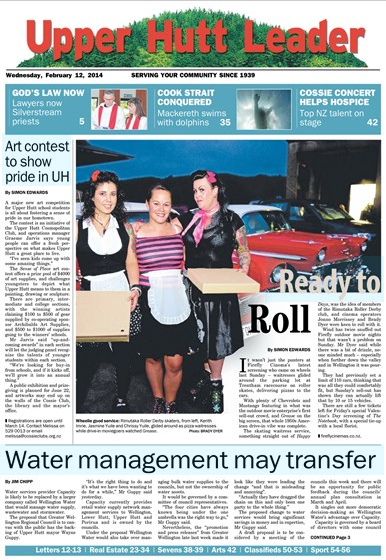 Wheelie good service: Rimutaka Roller Derby skaters, from left, Kerith Imrie, Jasmine Yuile and Chrissy Yuile, glided around as pizza waitresses while drive-in moviegoers watched Grease. It wasn’t just the punters at Firefly Cinema’s latest screening who came on wheels last Sunday – waitresses glided around the parking lot at Trentham racecourse on roller skates, delivering pizzas to the cars. With plenty of Chevrolets and Mustangs featuring in what was the outdoor movie enterprise’s first sell-out crowd, and Grease on the big screen, that whole 1950s American drive-in vibe was complete. The skating waitress service, something straight out of Happy to Days, was the idea of members of the Rimutaka Roller Derby club, and cinema operators Jonno Morrissey and Brady Dyer were keen to roll with it. Wind has twice snuffed out Firefly outdoor movie nights but that wasn’t a problem on Sunday. Mr Dyer said while there was a bit of drizzle, noone minded much – especially when further down the valley and in Wellington it was pouring. They had previously set a limit of 110 cars, thinking that was all they could comfortably fit, but Sunday’s sell-out has shown they can actually lift that by 10 or 15 vehicles. There are still a few tickets left for Friday’s special Valentine’s Day screening of The Notebook, with a special tie-up with a local florist.